The Clinton Foundation raised $26 million in Sweden whilst the Scandinavian government lobbied Hillary Clinton to ease U.S. sanctions on Iran. Sweden’s business dealings with Iran were at risk from new sanctions with Iran, according to the Washington Times. The William J. Clinton Foundation Insamlingsstiftelse had never been screened by the State Department ethics officials despite an agreement implemented in 2009 when Hillary Clinton became Secretary of State. The agreement was intended to implement a transparent review system of her husband, Bill Clinton’s, fundraising and public speaking activities. The review system would explore their potential dealings with foreign nations with any potential conflicting ties to the U.S. government. The Washington Times reported the State Department was not privy to some activities linked to the Clinton Foundation. The foundation’s Swedish arm slipped under regulators notice as it’s incorporation papers were filed in Stockholm. Also, the U.S. and Swedish based divisions were difficult to differentiate as the identities of the Swedish arm’s donors were disclosed in the U.S. based foundation’s reports. The Swedish fundraising arm was established at the same time as the Swedish government was worried about the possibility of new sanctions placed on Iran over its nuclear program. Wikileaks released State Department cables highlighting Swedish companies concerns over tighter sanctions against Tehran. ”Sweden does not support implementing tighter financial sanctions on Iran” and believes “more stringent financial standards could hurt Swedish exports,” read one leaked cable. Iran was Sweden’s second-largest Middle East export market after Saudi Arabia with Ericsson being Iran’s second-largest cellular supplier. Ericsson did not make any direct contributions to the Swedish division of the Clinton Foundation group yet it did pay former President Bill Clinton $750,000 for a Hong Kong speech in November 2011. The payment coming just weeks after Secretary of State Hillary Clinton announced the first sanctions list for Iran that did not include Ericsson and Volvo. The Clinton Foundation’s Swedish branch was established in 2011 to collect donations from lotteries in Sweden and utilize loopholes in Swedish law that allow the lotteries to send money abroad. 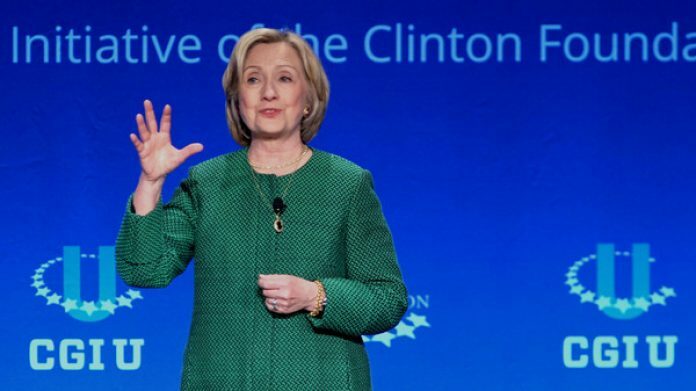 The Clinton Foundation told the Washington Times that it had received money for causes including fighting climate change, AIDS in Africa and cholera in Haiti. Hillary Clinton’s 2016 presidential campaign team has not commented on the story.